No 9 Ard na Gaoithe. Number 9 Ard na Gaoithe is a large detached residence occupying a prime site in a highly desirable and well regarded development on the Clybaun Road. Ard na Gaoithe is an exceptional development of spacious detached family homes on an elevated site with many of the homes orientated around a fabulous green area. Number 9 is ideally positioned enjoying a very pleasant outlook over the landscaped green to the front and boasting a southerly aspect to the rear. This most appealing owner occupied home has been well cared for by the owners. The residence boasts bright and generously proportioned accommodation which includes a wonderful, light filled, kitchen/dining/living area to the rear which is the heart of this home. This home offers light and space in abundance with a Velux window drawing light into the hallway. An entrance porch leads to the main hallway. Off the hall to the right is a wonderfully proportioned living room with bay window overlooking the green area. The living room boasts a Stanley stove and wooden floor. To the rear of the house is a bright and generously proportioned living/dining room/kitchen which enjoys a southerly aspect and direct access to the rear garden. The kitchen is finished with contemporary kitchen units with granite work surfaces and feature island unit. Off the kitchen is a utility room. Along the hallway there are four bedrooms, (two of which are en suite ), and a main bathroom and cloakroom. Outside to the front is a driveway and garden with a lawn and a range of maturing trees and shrubs. There are gates on both sides of the house leading to the rear garden. To the rear is a stunning garden which is a real suntrap enjoying a southerly aspect and is not overlooked. The rear garden includes a lawn, patio area, timber garden shed, and maturing shrubs and hedging. 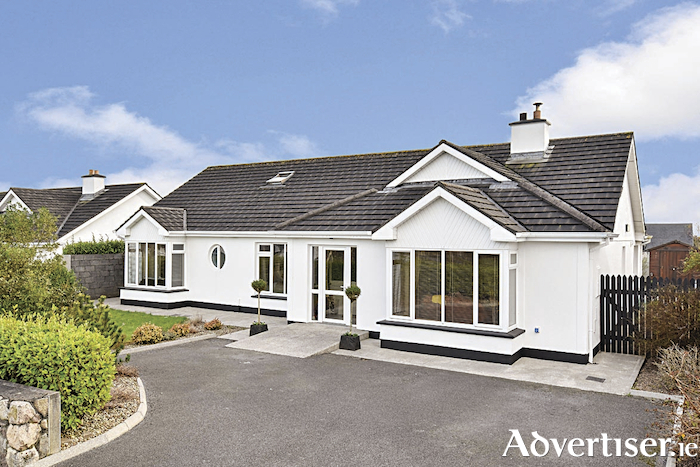 Ard na Gaoithe is conveniently situated close to all local services and amenities including Knocknacarra National School, Gaelscoil Mhic Amhlaigh, Colaiste na Coiribe, supermarkets, shops, the Clybaun Hotel, NRG Leisure Centre, Tom Sheridan’s Bar & Restaurant, and numerous sports clubs. Number 9 boasts all the essential ingredients for those seeking a family home and viewing is strongly recommended.